As we stand in one of the biggest waves of resistance this country has seen in decades, we are inspired by our past. It is a history of incredibly courage by ordinary people facing extraordinary injustice. But this month, we are also visioning a future where black lives matter, black love reigns and our people are free. What started as a week in the 1920’s and grew to a month in the 1970’s will inspire a movement today. 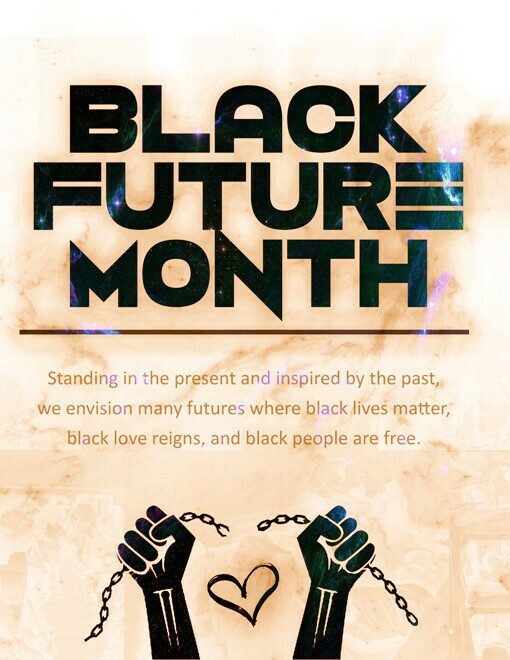 This month, we continue our year of resistance by kicking off #BlackFutureMonth. We should all be inspired by the will and tenacity of our people refusing the chains of our history and the limitations of our present. Feb. 13th: #BlackLoveDay Sure, you may have a boo and love them. But, on #BlackLoveDay, we show a greater love for our communities and ourselves through a series of events, forums and online actions. It’s Black Love vs. State Violence. And we will win. Feb. 21st: #Malcolm50 It’s been 50 years since Malcolm X was gunned down at the Audubon Ballroom. Channel his desire to put the United States on trial for their crimes against Black communities. In his honor, we continue the year of resistance and the movements he inspired by taking direct action on the 50th anniversary of his death. Organize creative, disruptive, direct actions in your community. This #BlackFutureMonth we are calling for communities across the country to organize or join, People’s Movement Assemblies (PMA’s) as a means to create democratic spaces to engage in local conversations around both demands and strategy. Also consider joining us as we call for a National Plan of Action for Racial Justice. We are calling for a national plan that would address ALL forms of racial discrimination in the United States.